First Nations activist Cindy Blackstock is now entering the final round of her long battle with the federal government over how much money Ottawa provides for child and family services on reserves. 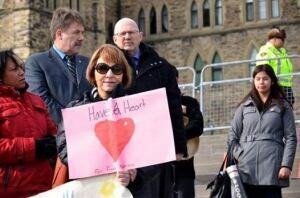 Blackstock, who serves as the executive director of the First Nations and Family Caring Society (FNFCS), filed the complaint against Ottawa with the Canadian Human Rights Commission in February 2007, together with the Assembly of First Nations (AFN). At issue is whether the federal government is discriminating against aboriginal children by providing less money for their care than what's provided to non-aboriginal children. "As a social worker, I see the impacts on First Nations children of the federal government's damaging, dangerous, discriminatory approach ... This is about children being placed in vulnerable, unsafe and harmful situations that can hurt them, their families and all Canadians," stated Blackstock in a press release issued today by the AFN. "It is not clear why any government would knowingly allow this to continue. They should be fighting for fairness for First Nations children instead of fighting against it. We will not and cannot allow this situation to continue." In the course of the case, Blackstock'ssocial media profiles were mined by the government - a move that violated her rights, according to the federal privacy commissioner. Blackstock says she hopes her experience will inspire others to speak out when they see injustice happening. She says she hopes her fight with Ottawa over funding for kids in care serves as an inspiration. The final arguments in this Canadian Human Rights Tribunal are being heard this week. A ruling is expected in 2015.